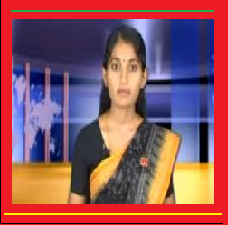 ENB WEST: பொஸ்னியாவில் வேலையற்றோர் 40%!! 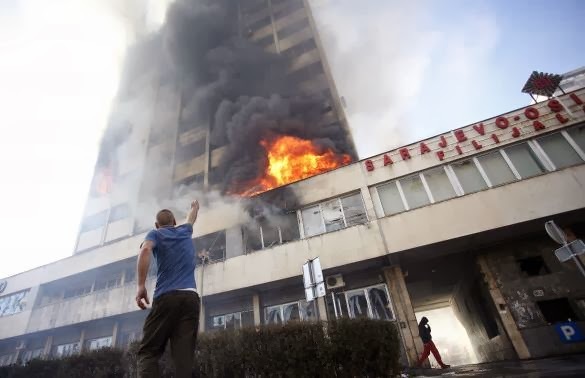 (Reuters) - Protesters across Bosnia set fire to government buildings and fought with riot police on Friday as long-simmering anger over lack of jobs and political inertia fuelled a third day of the worst civil unrest in Bosnia since a 1992-95 war. Protests remained largely contained to the Croat-Muslim Bosniak half of Bosnia but were gaining in intensity. By 7 p.m. (1800 GMT), protesters had dispersed in three flashpoint towns, including the capital Sarajevo, but police remained out in force. All shops were closed and streets were littered with glass and debris. 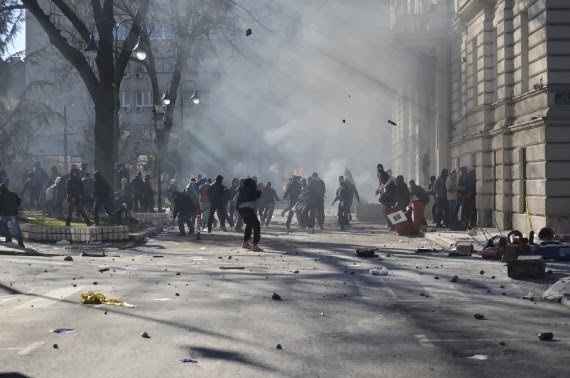 Hours earlier, police in Sarajevo fired rubber bullets at several thousand protesters who set fire to the headquarters of the cantonal government and to a section of the country's presidency building. The cantonal building was still smoldering in the evening. "This is so sad," said a woman, who would give only her first name, Vildana, watching the government building still in flames. "It took four years of war to destroy it and vandals now burned it in one day. This is just as in 1992." The protesters also tried to force their way into the presidency, but were repelled by special police firing water cannon. Around 145 people were injured in Sarajevo, including 93 policemen. Several thousand protesters in the southern town of Mostar stormed two local government buildings and also set fire to the local city hall. Police did not intervene. In the town of Tuzla, once the industrial heart of northern Bosnia, protests over factory closures again turned violent. Demonstrators stoned and torched two buildings of the local authority and clashed with police. 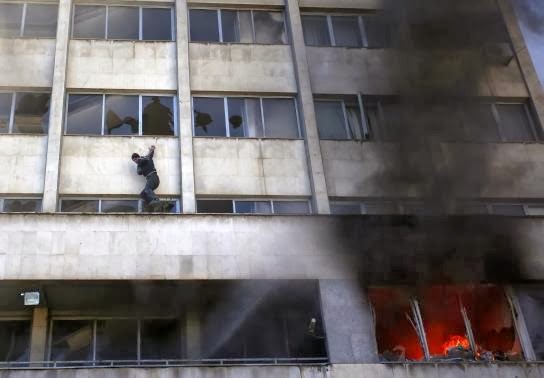 Trapped by the flames, some leapt from windows, a Reuters photographer said. 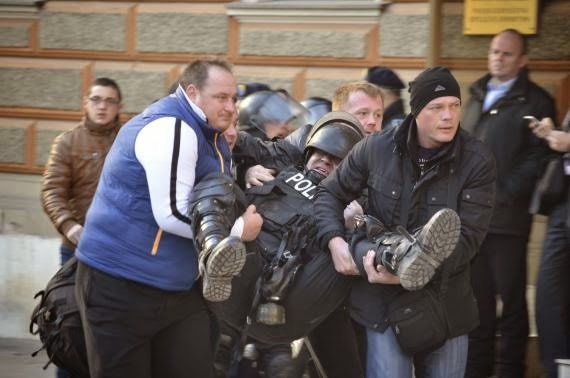 "I think this is a genuine Bosnian spring. We have nothing to lose. There will be more and more of us in the streets, there are around 550,000 unemployed people in Bosnia," said Almir Arnaut, an unemployed economist and activist from Tuzla. Some protesters took computers from the Tuzla municipal building and looted a local supermarket inside the building. In Sarajevo, two cars and a police guard's cabin were set on fire in front of the presidency building and black smoke was still seen hours later. A government building in the central town of Zenica was also set alight and around 55 people were injured, including 23 police officers. Protesters, many of whom heeded calls on Facebook to take to the streets, chanted "Thieves!" and "Revolution!" The Zenica and Tuzla cantonal governments, in charge of local issues such as privatizations, said on Friday that their chiefs had resigned in the face of the protests. In Banja Luka, the capital of Bosnia's Serb half, some 300 activists and citizens staged a peaceful march to call for unity among all Bosnia's ethnicities. "We are all citizens of Bosnia and we all have the same difficult lives here," organizer Aleksandar Zolja, president of the non-governmental organization Helsinki Citizens' Assembly, told the rally. Observers could point to no single cause for the protests, which started on Wednesday in Tuzla and spread to towns and cities across the impoverished former Yugoslav republic, where more than one in four of the workforce are jobless. The unrest is unprecedented in postwar Bosnia, where Serbs, Croats and Muslim Bosniaks have tolerated political stagnation for years rather than risk a return to conflict. Bosnia's recovery has been held hostage to an unwieldy power-sharing system based on ethnic quotas set in the U.S.-brokered peace deal that ended the war, in which an estimated 100,000 people died. Ethnic politicking has stymied governance and left the country trailing its ex-Yugoslav peers on the road to membership of the European Union, which neighboring Croatia joined last year. "What is happening is what was long expected to happen. If some people need to resign, they should resign," said Zeljko Komsic, the Croat member of the country's tripartite presidency. At least nine people were injured in Tuzla, police said, including two police officers, one of them seriously.